This stylish shop near the Peace Park in Otemachi, serves fantastic soba (buckwheat flour) noodles made fresh everyday. Conveniently open everyday from 11:30 in the morning to 11:30 at night, it’s a fantastic stand-by for city center dining. Look for the wood and glass corner shop with twine hanging over the windows. Having discovered this place soon after it opened, I wasn’t sure I could recommend it to those who don’t read Japanese as the menu was really hard work. However, having returned many times and taken friends who couldn’t read Japanese we discovered that, not only do they have a good (although limited) English menu available, they also have staff who are welcoming and good at clear communication to assist in ordering. We are big fans of the cold soba noodles, they are served in long wooden boxes of lightly boiled (and cooled) noodles with a dipping sauce. A few minutes after you start eating, you are given a container of the soba water to dilute your dipping sauce with (and drink too if you like). You can order side dishes of tempura vegetables, shrimp and duck (sets run around ¥1000). The hot noodles are also fantastic served in big, handmade ceramic bowls filled with a wonderfully savory dashi soup and noodles. My favorite topping on offer here is the ume (pickled plum) and wakame (seaweed) version available for around ¥1000. There are also hot noodles with tempura toppings, mountain potato and duck among other options. A favorite vegetarian side dish is the soba-dofu. 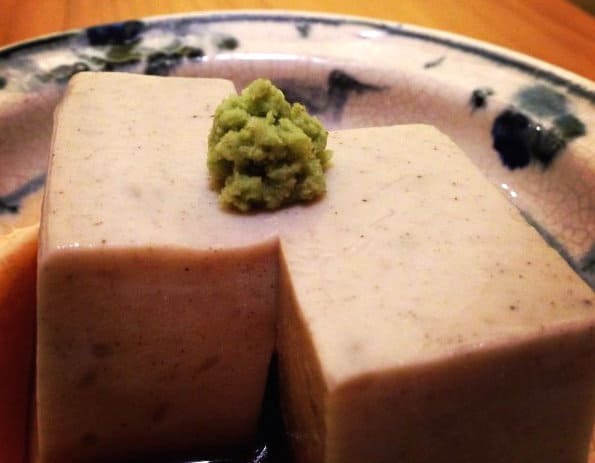 It is like a dense style of homemade tofu. For those who eat meat and fish, there are many other grilled meat and seafood side dishes to choose from. You can get a complimentary bowl or rice with any meal if you like, it is like fried rice with vegetables and pieces of fish in it, served with pickles on top. There are a few other shops of this chain around Japan and they advertise themselves as a soba shop as well as izakaya pub. This is likely why they have such long opening hours. There is seating for up to 6 at the back of the restaurant is next to a lit wall of homemade Japanese washi paper. The rest of the dining area can seat around 20 people and feature strong wooden tables, wicker chairs and chopsticks resting on peanut shells. The restroom has a fancy western style toilet and is feels like you are enjoying a quiet moment in a bamboo forest thanks to all the thin, stone tiles. Look for the sink button on the floor when going to wash your hands (this was not obvious to me at first). No reservations accepted at lunch, but you can reserve tables in the evening. No parking or parking discounts available. There is an English menu available if you ask.